Thomas Sankara, a man in his early thirties transformed the world`s poorest country at that time, Upper Volta, into a self-sufficient modern thinking nation in just four years. This African miracle nation remains little known about in the West because its story contradicts every negative image that has ever been painted of African leadership and African nations. Sankara would prove to the people of Burkina Faso, to other African nations and to the colonial powers what could be achieved in the blink of an eye by Africans under African leaders of integrity. Upper Volta in 1983 was little more than a French run labour camp for French run Cote D`Ivoire. This region of West Africa was up until the mid-1800`s part of the ancient Mossi Kingdom, and has always been called `The Land of Upright Men`, men of integrity, hence the name Burkina Faso. Spiritually the people of this region are of great significance and still to this day practice the world`s most ancient belief. 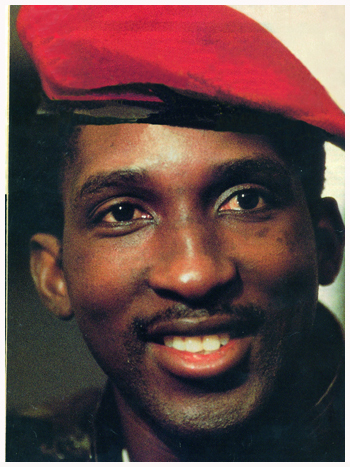 In the August Revolution, Sankara and the military overthrew the CSP (Council for the Salvation of the People) headed by conservative Jean-Baptiste Quedraogo and formed a new government of the National Council of the Revolution (CNR). Two years later infant mortality had dropped from 280 deaths for every 1000 births to 145, with the aid of Cuban volunteers and a mass vaccination program. School attendance rose, in two years, from 12% to 22%. In just the first year of its implementation, Sankara`s environmental program to halt desertification in this Sahel region, over 10 million trees were planted. Without international aid which was not forthcoming from the World Bank with which to improve infrastructure, Sankara and the population got down and dirty and with their bare hands and laid hundreds of kilometres of railway track to facilitate manganese extraction. This was not done by forced labour at gunpoint, there were no bloodbaths under Sankara who did not believe in war but instead, in ideas. Like Gamal Nasser of Egypt, Sankara got the people of his country to prove to themselves that they could achieve anything they put their minds and hearts into. The previous government were brought before a tribunal and asked to explain to the people of the country why they had misappropriated so much money. This was there only form of punishment and public humiliation. This is on record. One of Sankara`s first acts as president was to slash his ministers` salaries, starting with his own. He sold the previous government`s fleet of mercs and replaced them with little Renault 5s, which is what he drove. This is a stark contrast to the Kenyan governmental 2003 purchase of $12 million worth of luxury cars. Sankara remained humble and refused to allow his portrait to be displayed across the country, explaining that it was their revolution and that “There are 7 million Thomas Sankaras.” At the time of his assassination his salary in 1987, was $450 a month and he owned one car and four push bikes. Sankara dissolved all other political parties, seen by him as representative of the colonial powers and open to subversion, just as did Kwame Nkrumah in Ghana. “Our country produces enough to feed us all. We can even produce more than we need. Unfortunately for lack of organization we still need to beg for food aid. This type of assistance is counter-productive and has kept us thinking that we can only be beggars who need aid. We must put aside this type of aid and succeed in producing more because the one who feeds you usually imposes his will on you. Let us consume what we can control. Some people ask me: But where is imperialism? Just look into your plates; you see imported corn, rice or millet. This is imperialism. No need to look any further………………………Of course, we encourage aid that aids us in doing away with aid. But in general welfare and aid policies have only ended up disorganizing us; thus beguiling us and robbing us of a sense of responsibility for our own economic, political and cultural affairs. We choose to risk new paths to achieve greater well-being.” Thomas Sankara recognized the pseudo-philanthropy, the humanitarian effort for what it is in Africa today. That it is the same as “Debt is a cleverly managed re-conquest of Africa”, which he said before the OAU summit in 1987.In his enlightened understanding of economics, he refused all but essential aid and encouraged instead for people to buy produce and products grown or manufactured within Burkina Faso. This policy for the domestic economy`s revival ( which happens to be the exact opposite of all World Bank economic policy) created in just 4 years, a cotton growing, processing and fabric industry that beautifully clothed the entire population as well as exporting. So people would feel pride in modern-traditional clothes, in Burkinabe fashions and look African instead of advertising coke and blue jeans. All government workers, teachers etc. had to wear Burkinabe clothes. (This was actually not to everyone`s taste so government workers tended to have a spare outfit at all times in case Sankara called by, they called the traditional clothes the Sankara- is- coming- outfit). Sankara started a mass housing project and brick factories to build homes so no-one would live in an urban slum but would live with dignity whether in the rural areas or in a city. In 4 years all regions of Burkina Faso were connected by a network of roads. Sankara was the first African leader to encourage people to take up sport or other forms of fitness as “ A healthy mind in a healthy body”. And Sankara was the first president to speak about real environmentalism. He started a project to plant a grove in every village, a grove of trees and shrubs to remind people to respect and protect the land. Tens of millions of trees were planted in under 4 years to combat desertification. During all of these programs Sankara got down and dirty; he personally planted hundreds of trees, made bricks and laid stones on railway lines, there were no tasks that he asked people to perform that he wouldn`t do himself. This man was a hero . Within 4 years Burkina Faso had become self sufficient. The average for the Sahel region is 1700kg of wheat per hectare. In 1986 Burkina Faso was already producing 3900kg of wheat per hectare. Within Sankara’s understanding of the nature of colonialism and how it had undermined Africans own self-worth and within his understanding of neo colonialism and how subversive force counter-revolutionized people back into accepting western economics; were the reasons for his political, ideological indoctrination of the people. He forced into people`s minds progressive thinking and had them repeat mantras of how they were going to change the future of themselves, each other and their country. These activities were labelled by Western media as communist indoctrination meetings. Sankara started the Pioneers Movement which trained children under twelve in socialist ideology. He knew they would be the county`s future and his efforts were to oppose what he knew would take place in Western-backed counter-revolutionary thought. His ideological training of the adult population was based on a number of de-brainwashing techniques, to instil new positive thinking and confidence but also as he said:”…. a soldier without any political or ideological training is a potential criminal.” He didn`t want Burkina Faso to ever become part of an orchestrated bloodbath run by armed men with no aim, no principles and only gain, which he saw happening across Africa. Already by 1984 Sankara`s revolution was influencing people across the continent, giving hope and questions to people and giving ground for fear from the imperialist powers. The final nail in the coffin for this sublime hero of Africa was what he later said at the OAU summit in 1987.He asked the leaders present in the most affable manner to unilaterally reject African debt.” A loan is a gamble, like in a casino “, he explained that while African states remain in debt to the colonial powers they will remain dependents. He put forward an economic solution for Africa that is in complete contrast to World Bank policy and said “ Let’s make sure that the African market belongs to Africans. Let’s produce in Africa, manufacture in Africa and consume in Africa. Let’s produce what we need and consume what we produce.”…”The Debt problem needs to be analysed starting from its origins. Those who lent money to us are the same people who colonized us, are the same who so long managed our states and our economies; they in-debted Africa with `donations` of money. We were not involved in the creation of this debt, so we should not pay it. The debt, moreover, is linked to the machinery of neo-colonialism, the colonizers became technical assistants, I would call them technical assassins, and they suggested, recommended to us the financiers, they told us about the financial advantages. That is why we indebted ourselves for decades and renounced the satisfaction of our people`s needs. In today`s shape, controlled and dominated by imperialism, the foreign debt is a well-organized tool of colonial re-conquest: in order to make the African economy a slave of those who were so clever as to give us capital with the obligation of reimbursing them. We are asked to reimburse our debt. But if we do not pay, the capital lenders will not die, if we pay, we will die. We cannot pay, and we don`t want to pay. We are not responsible for the debt burden. We have already paid a lot of the debt. We are asked to co-operate in researching balance mechanisms, balance in favour of those who own the financial institutions and use the power against the peoples. We cannot be accomplices. The Paris Club is there, let`s create the Addis Ababa Club for cancelling our foreign debt. Our Club should say-our debt will not be paid. Don`t think it is a proposal made only by young people like us. Mrs Bruntland said African countries cannot pay, as did Mr Mitterrand and Fidel Castro…we should explain in other conferences that we cannot pay. We must be united, otherwise, individually we will be murdered. Avoiding debt repayment is a condition which will allow us to free resources for our development.” Source: Asad Ismi, `Impoverishing a Continent: The World Bank and the IMF in Africa`,2004, pdf. The assembled “open unpatriotic sons of Africa”, bought and paid for by foreign powers and their corporations, refused to hear him and just as he knew would happen if they did not back him in unison, Sankara was not present at the following year`s OAU summit. Back in Burkina Faso with French Intelligence and the Foccart business network behind them, Blaise Compaore began agitating, telling people that Sankara was holding back from them the prosperity on offer. Compaore and his top military men assassinated Thomas Sankara on the 15 October 1987. “In a way, great men enlighten people, enlighten their time long after they`ve gone; and I say after their death because its when you`ve lost something that you become aware of its true value. Sankara has become a moral and spiritual reference for us all.” Source: Jean-Hubert Bazie from Robin Shuffield`s documentary. Please tell me where I can find economic and agricultural data about Burkina Faso’s food production during Sankara’s presidency. Domestic food production seems to be the one major hurdle preventing exponential development throughout many counties in Africa. You say that during his presidency he managed to bolster wheat production in Burkina Faso to nearly double that of neighboring countries. What is your source for the details of his policies? How were the policies enforced? Also, what was your source for the numbers you gave concerning wheat production? I want to compare Burkina Faso’s circumstances then to its circumstances (and those of similarly positioned countries) to see whether or not another Sankara could be the solution to the continent’s woes. If so, then maybe we Africans in America should invest our energies in supporting Sankara like political leadership in Africa.